Avinash V Gawande, Rajan Kumar Barnwal, Uday W Narlawar. Background: Medical residents are exposed to numerous stressors during their post-graduate training which affects them both physically and emotionally. This stress can have a profound impact on the resident’s ability to work and perform activities of daily living. Objectives: The goals of this study are to (1) estimate the psychological stress in medical post-graduate doctors and (2) study the sociodemographic factors associated with stress in post-graduate doctors. 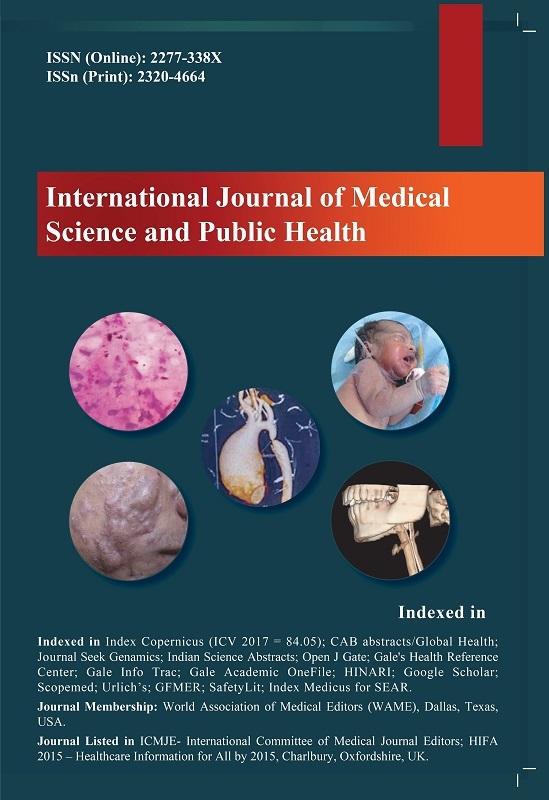 Materials and Methods: This was a cross-sectional study of resident doctors in a tertiary care hospital in Central India. A total of 130 medical residents at a tertiary hospital in Central India were surveyed anonymously using the Kessler psychological distress reporting scale questionnaire (K10) + self-reporting measure. Descriptive statistics as well as Pearson’s Chi-square test (Ï‡2) and odds ratios were used to quantify the associations between categorical variables using SPSS v24.0 software. P < 0.05 was considered statistically significant. Results: A total of 131 (of 138, with a response rate of 95%) medical post-graduate residents were participated in this study. The mean age of study participants was 27 years. The results showed that there was no statistical gender difference when it came to reports of stress among the residents. Moderate amounts of stress were reported by the residents, with some of this stress requiring time off from the residency and/or medical care. Conclusions: This study has shown that postgraduate medical residents at a tertiary care hospital in Central India experience increased amounts of stress during their residency training.